This boy has a rhabdomyosarcoma (RMS), a malignant mesenchymal tumor of skeletal muscle derivation. 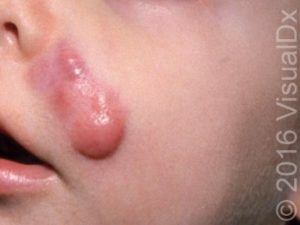 Though rare in adults, it is the most common soft tissue carcinoma in children and adolescents. Acknowledgment: Image courtesy of VisualDx.